Twined rugs are worked from each end to an area near the middle of the frame. This rug has progressed fairly quickly and, in this photo, is nearing completion. 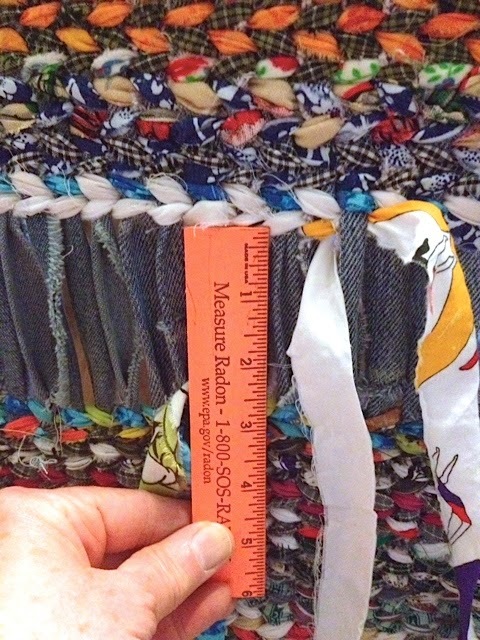 As the open area gets smaller, it takes longer and longer to maneuver the fabric strips through the warp strips. 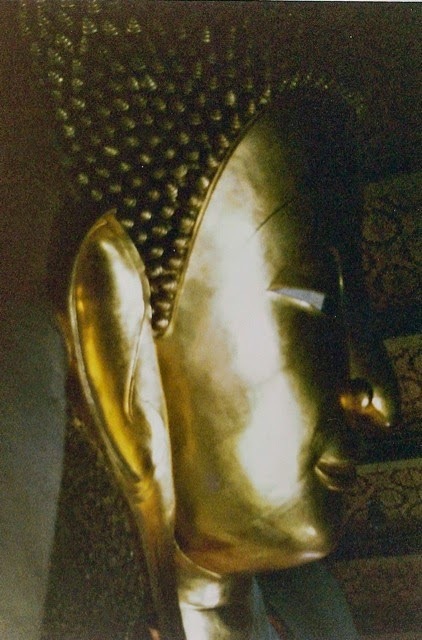 The Golden Buddha is the world's largest solid gold buddha. It is nearly 10 foot tall and weighs over 5 ton. 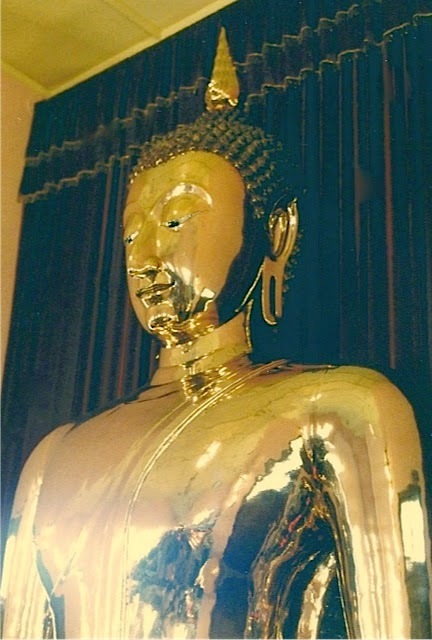 Click on the link for additional information about the buddha and its history. 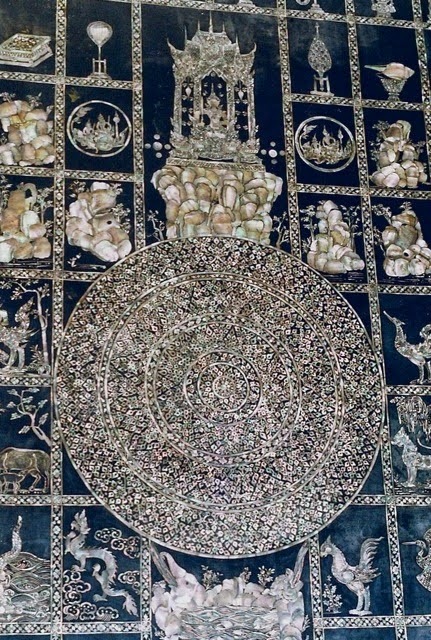 The buddha was beautiful; however, it saddened me to see the abject poverty immediately outside the door of the temple where this priceless object was housed. 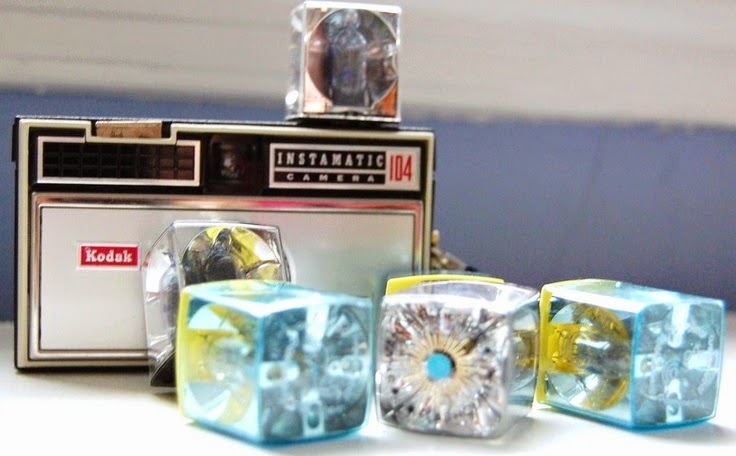 I remember when flash "cubes" were introduced in the 1960s. The cubes contained four small bulbs, and the cube automatically rotated to the next bulb when a photo was taken. Electronic flashes were used widely in the 1970s and 1980s. 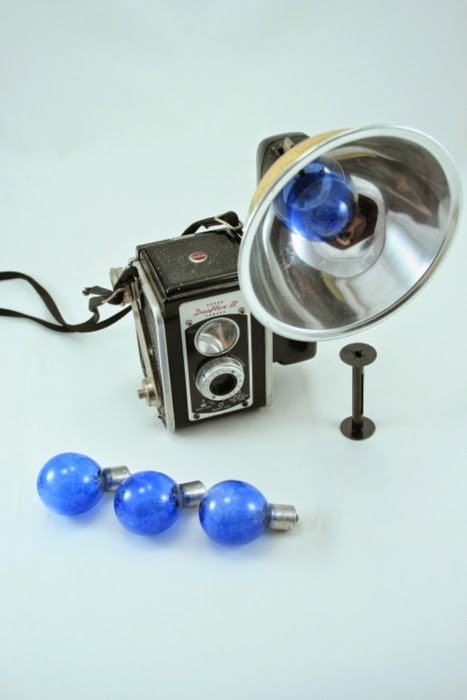 Do you remember using flash bulbs or flash cubes when taking photos? Friday evening, my friend Sue and I went to a Quilt of Valor (QOV) Sew-in, sponsored by a local quilt shop and the Wyoming QOV coordinator. 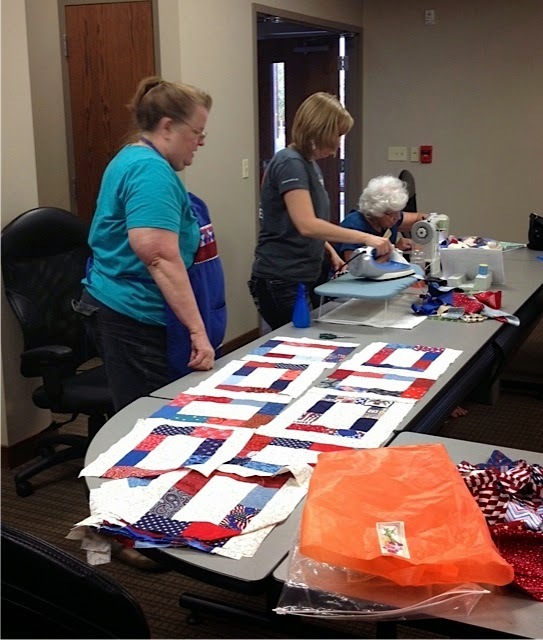 Local businesses purchased quilt kits for the volunteers to assemble. I spent the evening pressing and trimming; Sue prepared fabric for the blocks for another lady who manned the sewing machine. In less than two hours, the three of us finished 35 blocks. About 12 additional volunteers worked on various QOV kits and patterns. The three ladies in the photo were working with scraps from previous sew-ins. I had other plans on Saturday, so I didn't get to see the finished quilt tops. I Feel Like Dancing. . .
Last Thursday and Friday, I literally felt like dancing in the street when I saw the paving machine and the steam roller make their journeys up and down in front of my house. I've lived on this street for over 20 years, and each year the condition of the asphalt deteriorated down to the gravel road base. I complained about the streets in my neighborhood to the mayor, the public works director, and the city council. I knocked on the doors of houses on three streets and asked the occupants to fill out forms and send them to the city. Two years ago, Fremont County voters approved a four-year, one cent sales tax, entitled Fix Our Roads. With its passage, my dream of having the neighborhood streets repaired became more of a possibility. I attended several meetings of the Fix Our Roads Committee and requested my neighborhood streets be placed on the list for repair. 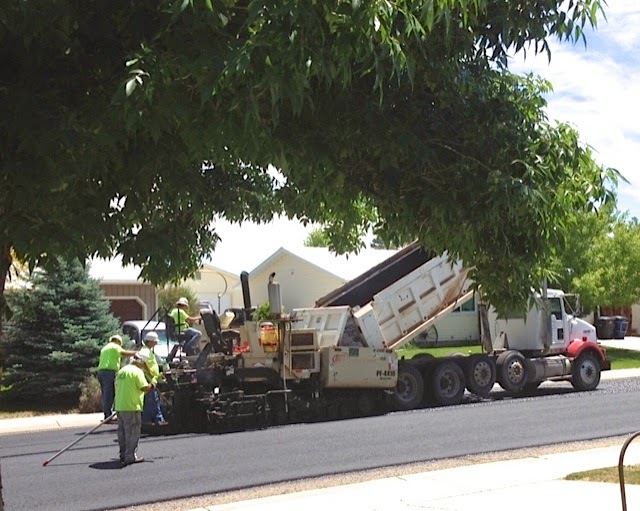 I was thrilled last summer when the committee placed my neighborhood at the top of the list for street repair; however, the city council refused to allocate the repairs until the money was in hand. In early May, I contacted the public works office and was told that work would begin on May 12, 2014, and indeed, cement work began that day. 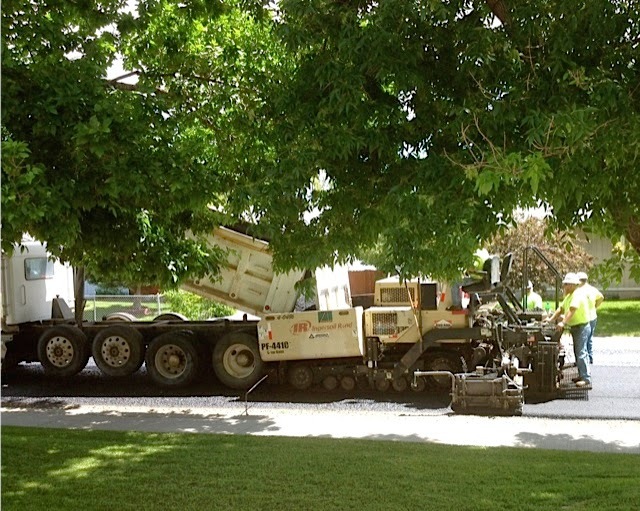 The paving contractor delivered notices of street closure to the houses on my block on Wednesday, June 18, 2014. I nearly hugged the guy that came to my door. What a difference a smooth surface makes. I can actually walk across the street without worrying about turning my ankle on loose stones. The noise level of passing cars and trucks has been reduced considerably. I feel like "dancing in the street." While in Denver I purchased a new MacBook at the Park Meadows Apple Store. This store is always a madhouse of activity. The air practically buzzes from the numerous conversations; add the shrieking of an unhappy child being pulled away from the children's table by an impatient parent, and the noise level is nearly intolerable. I love Apple products and have used them for years, but I do not understand why the process to get assistance is so frustrating and complicated. I knew what I wanted to purchase, but I first had to find an associate in a blue shirt with an iPad in order to be placed on a list for a sales associate. The store was filled with blue-shirted individuals, but many had iPhones and could not help me. Finding the person with the iPad was like a scavenger hunt. In my opinion, this person should be stationed at or near the entrance to greet and assist people as they enter. Once I was on the iPad list, the process went more quickly. After I purchased the computer, I was passed off to the person in a blue shirt with a green iPad, who scheduled a Genius Bar appointment so I could leave my old computer to have the files transferred to the new laptop. 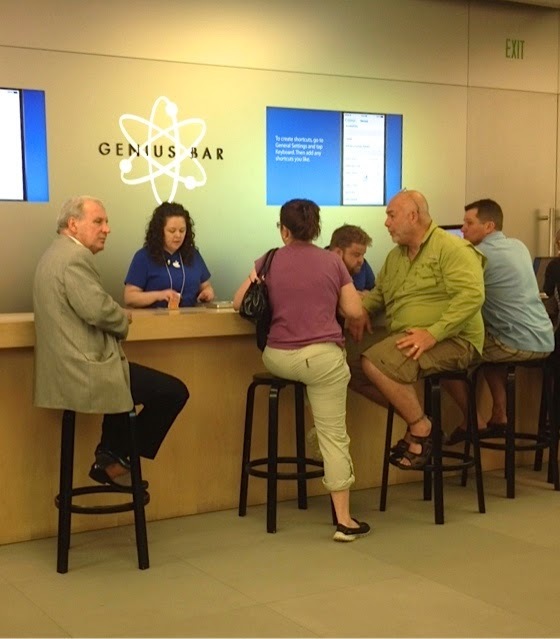 I sat in the Genius Bar area for nearly 40 minutes waiting for a genius in a blue shirt. My assigned "genius" was not the sharpest crayon in the box and spent nearly 15 minutes asking other blue shirts how to make my request for the data transfer and how to note that I wanted the old laptop recycled. A day and a half later, an email informed me the new computer was ready for pickup. At the Genius Bar, another blue shirt presented me with the new laptop as well as my old one. At this point, I thought it would be easier to recycle the old computer myself rather than try to explain my original intent. Perhaps this system is efficient, but I think it adds unnecessary frustration for the consumer. I still love Apple products, but I do NOT like the in-store experience. I had the opportunity to see much of Japan in the two years I worked for the Department of Defense Dependent Schools (DODDS). I toured Japan by car, by train, by plane, and by ship. My travels took me to the northern island of Hokkaido and the tiny island chain south of the main island of Honshu and Kyushu. 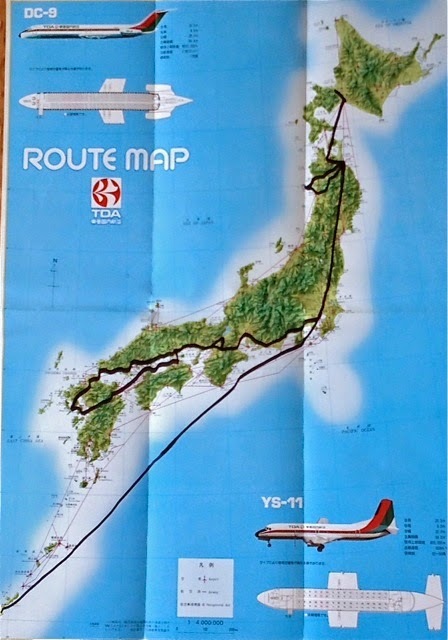 As the map indicates, I did not see much of western Japan. Even though the world is a much different place now, I am confident that what I loved about Japan has not changed: the culture is based on traditions, observed for centuries. I think many walkers from this time period were also strollers. To convert to a walker the handle was removed as were the grates under the child's feet. Once these items were removed the child was free to navigate. From this photo, it appears my sister took the stroller over some pretty uneven ground. 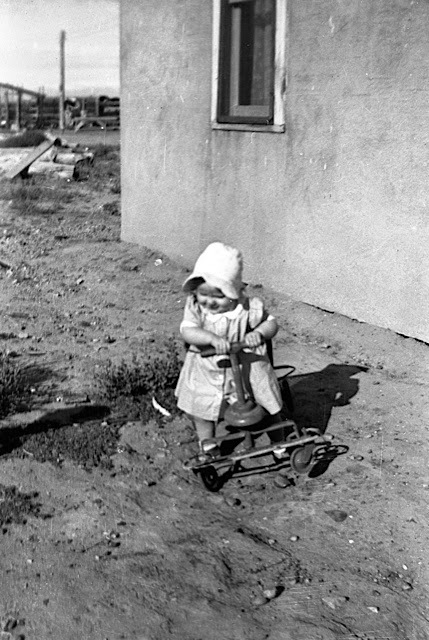 Later stroller/walker combos had a tray on the front to hold toys, etc. Have you seen these stroller/walker combos? It has been a long time since I've done any twining. However, since I'm going to demonstrate the technique at the Fiber Guild Fiber Fest in October, I thought it might be wise to make a couple of rugs to refresh my skills. My fingers and hands fell into the rhythm with little difficulty. Normally, I sew the strips together as I twine, but a sewing machine might not be too handy to use during the demonstration; thus, I'm making this rug by connecting the strips with the slit and loop method. This method speeds up the process but also creates more bumps and knots in the rug. Older posts on twining and the rugs I've made can be found here. I spent the last week in Denver, visiting my sister. On Friday and Monday, I exercised with my niece (Brenda) and great-nephew (Chris) at the fitness room in Brenda's sub-division. On Tuesday morning, I walked up the hill from my sister's house. 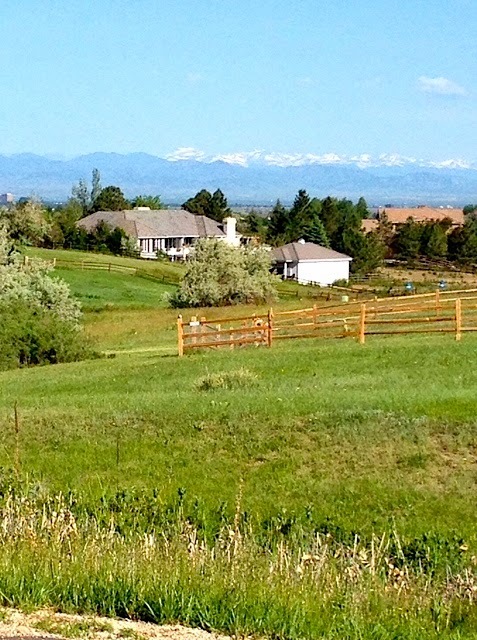 Coming down the hill, I paused and snapped this photo of the Colorado Rockies. During my visit, the weather was usually gorgeous in the morning and overcast and threatening rain in the afternoon. One evening, the sky darkened and all of our phones sent tornado alerts. Thankfully, no tornados touched down, but the sky opened up and dropped buckets of rain throughout the night. 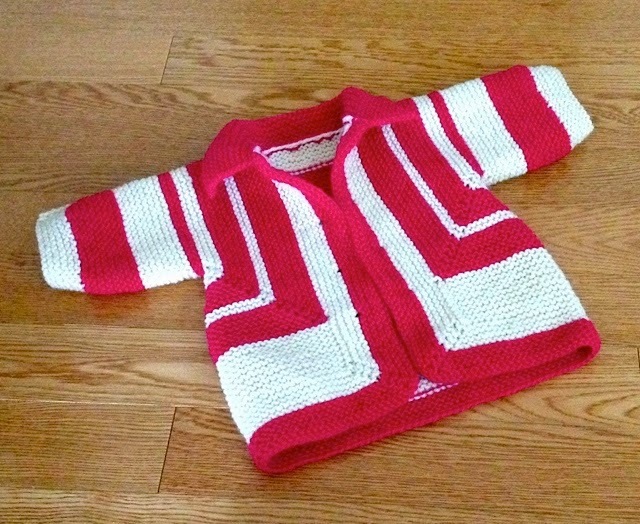 The latest Baby Surprise Jacket is off of the needles, seamed, and has an added collar. Specific details (pattern, yarn, needles) can be found on this earlier post. I still need to find and sew buttons on this little sweater. Collar details: pick up 18 stitches along each front neck edge and 20 stitches along the back of the neck. To prevent the collar from overlapping the buttons in the front, begin and/or stop picking up stitches at least four stitches from the front cast off edges. Knit 22 rows (11 ridges) and cast off in purl on the right side. When traveling it is important to carry coins and bills from the countries you are visiting. Having the foreign money provides peace of mind that you can purchase food, pay for a taxi, make a phone call, and tip if appropriate. It's never wise to cash in or spend all of your foreign money before leaving a country because the unexpected can always occur. I came home with a few dollars from some of the countries I visited. Of course, most of the money is from Japan. I never bothered to exchange any of the money when I returned to the base or even when I returned to the U.S. The exchange rate for a U.S. dollar was very good in 1979, nearly $2.30 for 100 yen; the exchange rate now is closer to $1 to 101 yen. 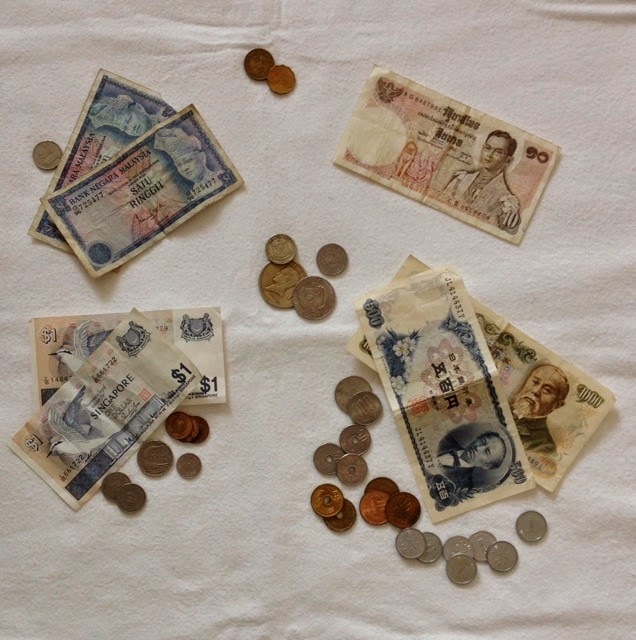 According to exchange-rates.org, the Japanese yen in the photo would total approximate $17 at today's exchange rate. 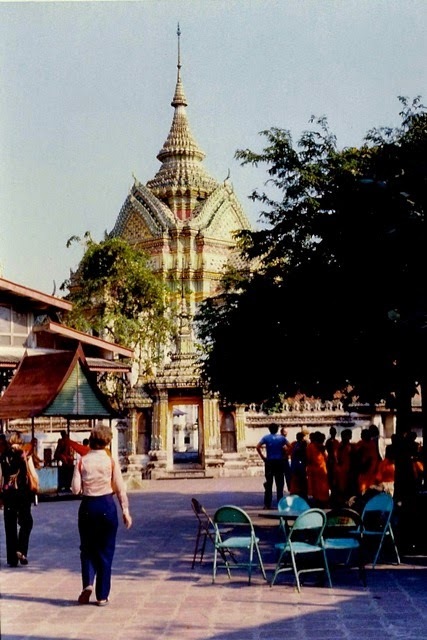 Today, the Thai bhat is worth $2.75, Singapore dollars and odd coins approximately $2; the two Malaysian ringgits approximately 62 cents today. The odd coins from the Philippines and Hong Kong are probably less than a dollar each. The exchange rate is fluid and changes from day to day. A wise traveller keeps an eye on the rate and tries to exchange money when the value is the greatest. Have you kept foreign money as a souvenir of your travels? 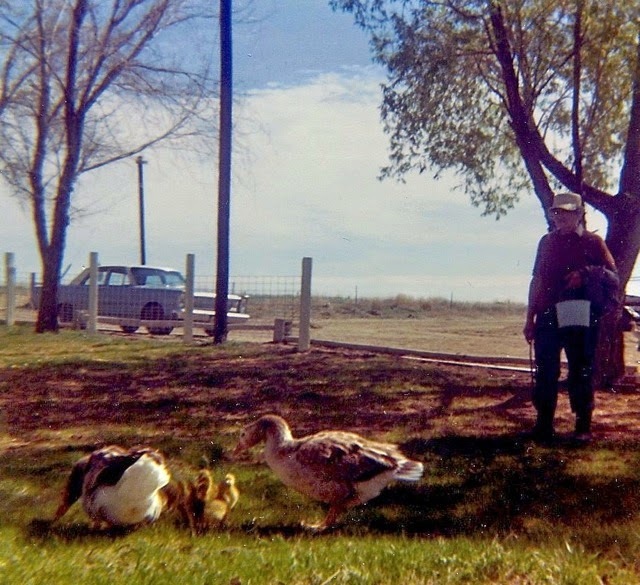 My mother loved her geese, and the numbers grew steadily every year. 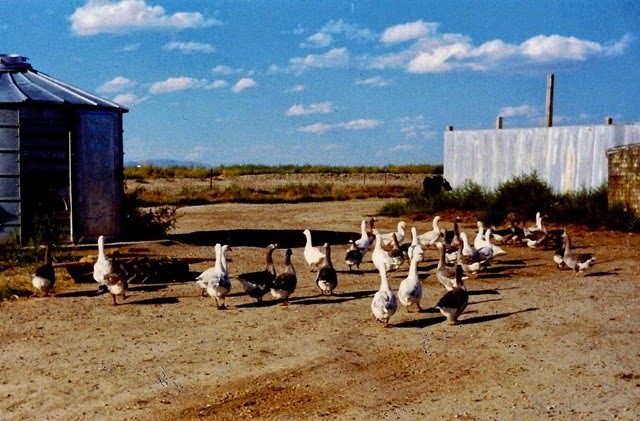 It was common to see the flock (gaggle) parade around the yard and even across the County road to swim in the irrigation ditch. One year the ditch rider complained about the geese in the ditch, but his complaints fell on deaf ears because the geese kept the algae in the ditch under control. Mom's geese got a bit territorial in the spring, and it was wise to give them a wide berth, especially near their nests. The goose and gander took turns sitting on the large eggs. They both would extend their necks and hiss if someone got too close to the nest. 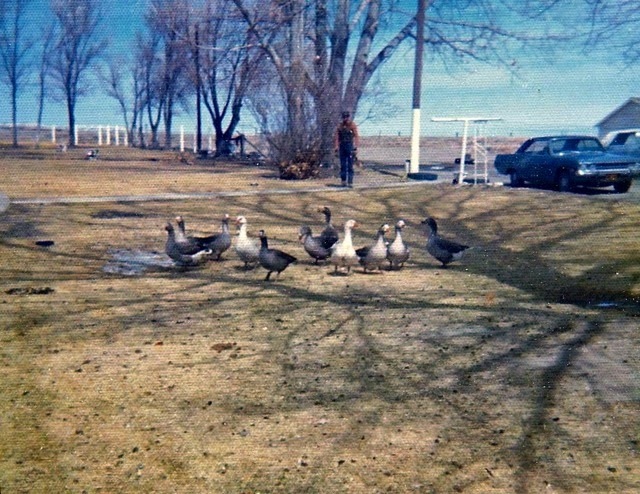 It was common to see the ganders chase the dogs across the yard if they got too close to the flock or to the goslings. I've also seen the geese as well as the ganders chase people who got too close. One year, my nephews took a gosling from a nest to raise at their home in the Gas Hills. They named the goose, Charlie because they thought it was a gander; however, Charlie was a goose. 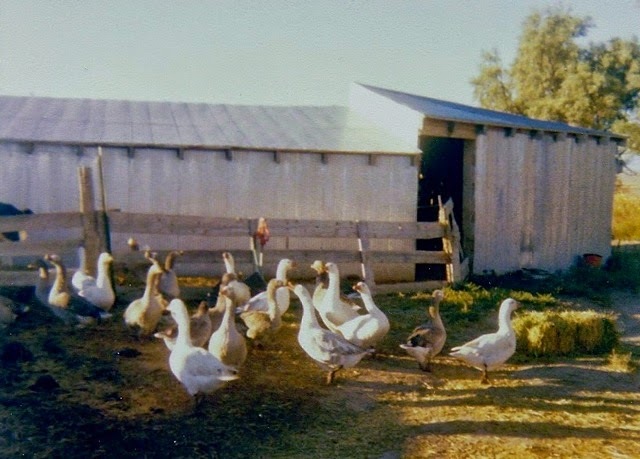 She was spoiled and eventually came back to live on the farm and raise goslings of her own. 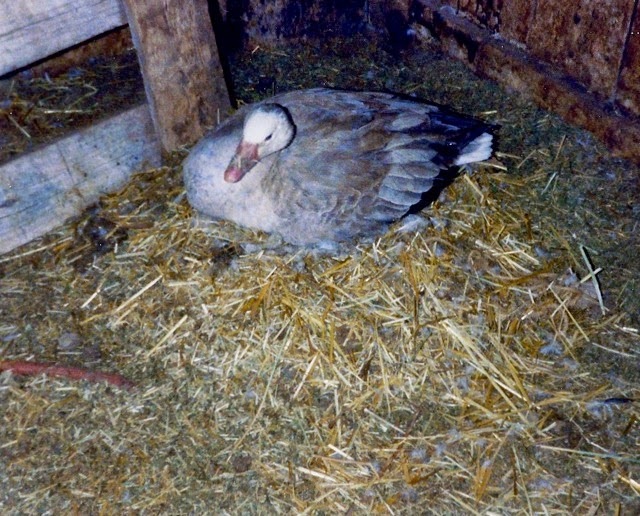 For several years, around the holidays, my mother took orders for freshly killed and dressed geese. On those occasions, I helped her catch and kill the geese. It was crucial to grab the geese at the base of their wings and hold tight; if not, they could slap with their powerful wings, and that hurt! Mom saved the goose down in a bag and hung it on the clothesline. When the bag was full, she would launder the fluffy down and save it for pillows. I still have some of Mom's goose-down pillows. The female geese were gray; the males, white. The geese could be quite vocal, too, and sometimes were better than a barking dog for announcing unexpected visitors. Mom's geese did not fly; however, they often tried, but they simply could not get off of the ground high enough to call it flying. nothing is a miracle; the other, as though everything is a miracle. 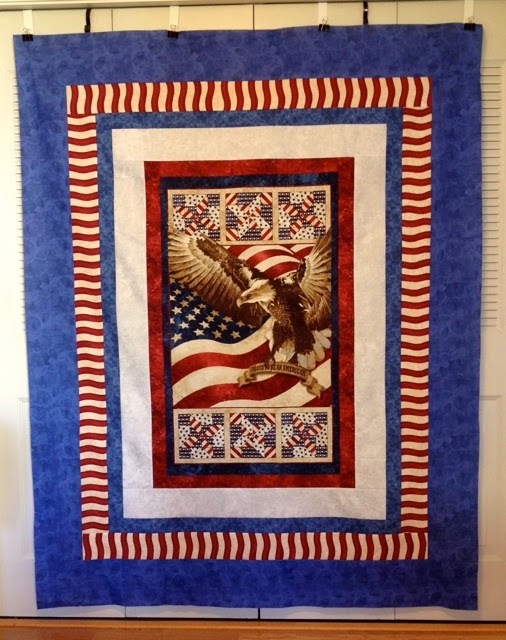 American Patriot and Duty Bound (yesterday's post) were made at the same time with different border fabrics to create two noticeably different quilts. 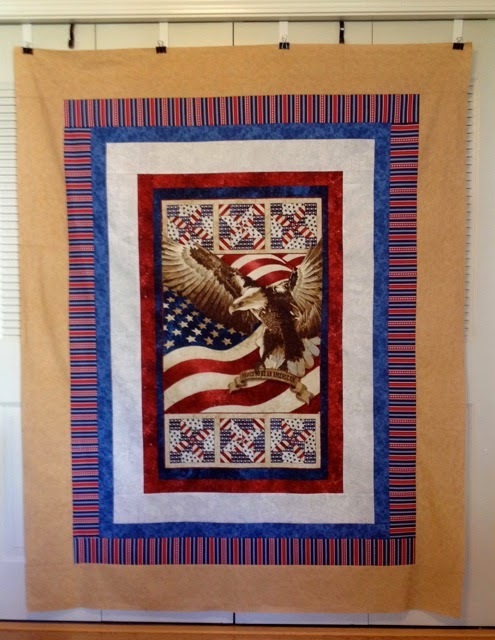 American Patriot's binding will be the bold-striped fabric. Duty Bound started with the pre-printed center panel, to which I added five borders of various widths to meet the Quilt of Valor size requirements. Duty Bound's binding will be the red, white, and blue striped fabric. 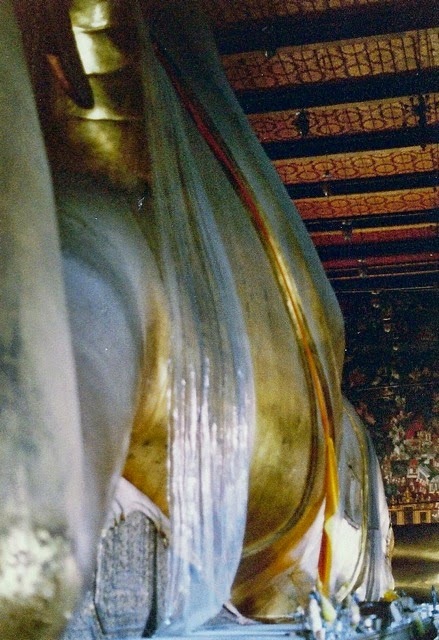 It was extremely difficult to get a photo of the Reclining Buddha for two reasons: the statue was being refurbished and it was massive. 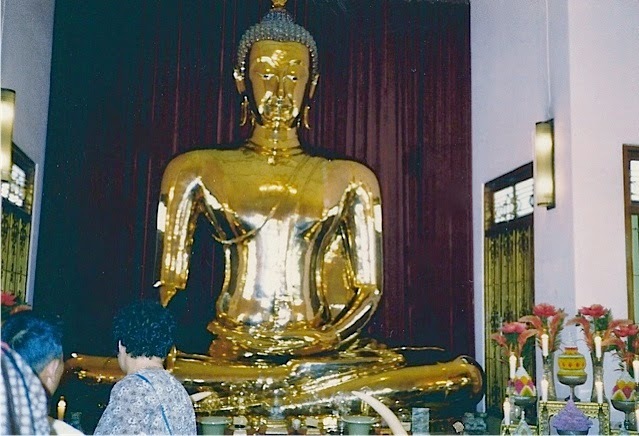 The buddha is over 49 feet high and 141 feet long. 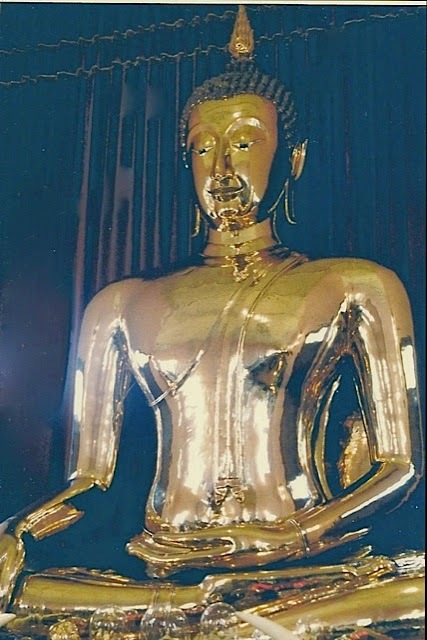 Note the buddha's feet are barely visible on the far right of the torso photo. 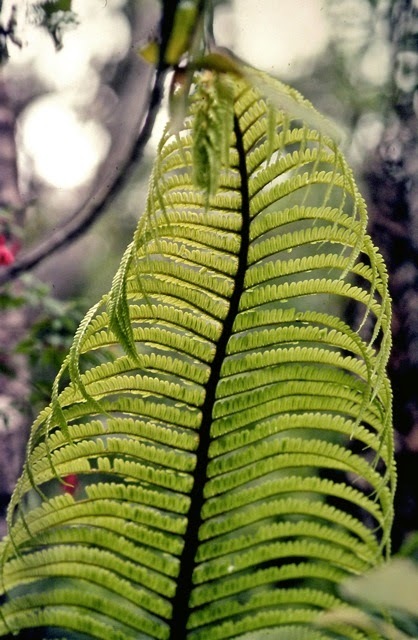 The feet are over 9 feet high and over 14 feet long. Note the toes on the far left in the photo above. 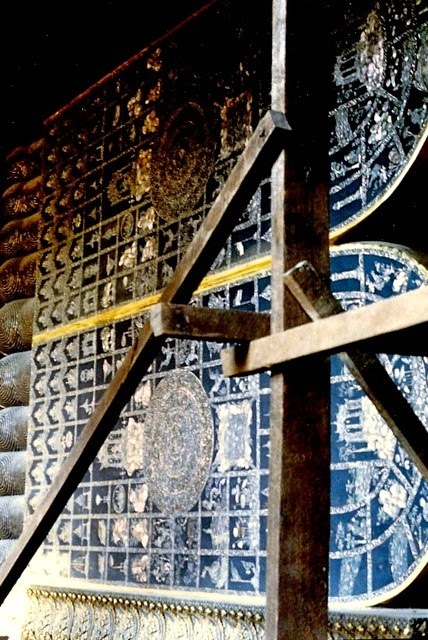 Information about the temple and a scaffold-free photo of the buddha can be seen here. Wyoma S. Jerry S., Ivabelle S., Grandma Annie, and Evelyn S.
I think this photo was taken in Wyoming, but I am not certain. Uncle Charlie was my dad's youngest brother. I never knew Uncle Charlie's first wife because they were divorced by the time I was born. I may have identified the older girls incorrectly, as my uncle and his first wife had three girls (Wyoma, Ivabelle, and Dorothy), and I am not sure of their birth order. My dad's mother, shown steadying my oldest sister in this photo, died the year before I was born. 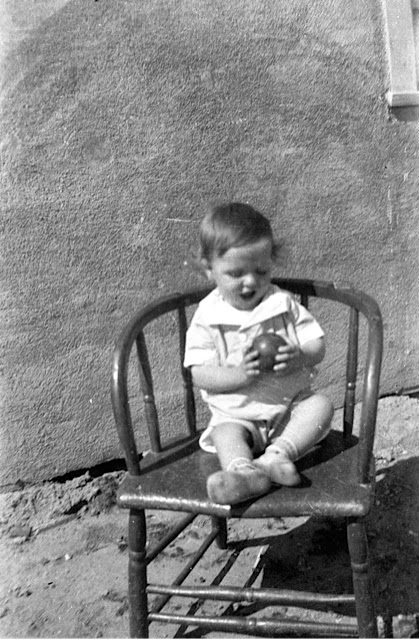 I only knew one of my grandparents - my maternal grandfather. 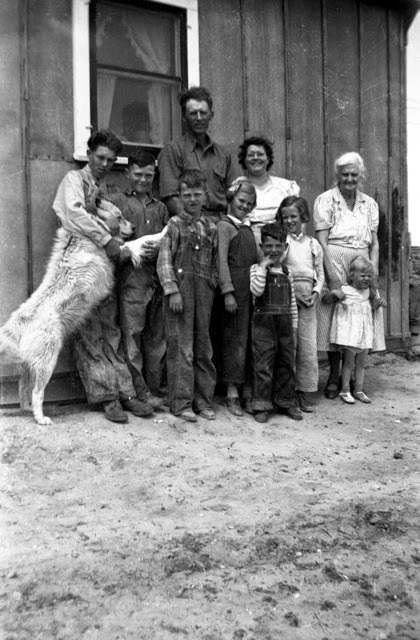 John, Richard, Jerry, and Evelyn, shown in this photo are my oldest siblings. Last week, I finally added binding to this table mat made with the waste triangles from the construction of Star Gazer, a Quilt of Valor finished in 2012. I originally wanted to make something larger with the half-square triangles, but in the end, I simply sewed them into pinwheels and then into this mat. 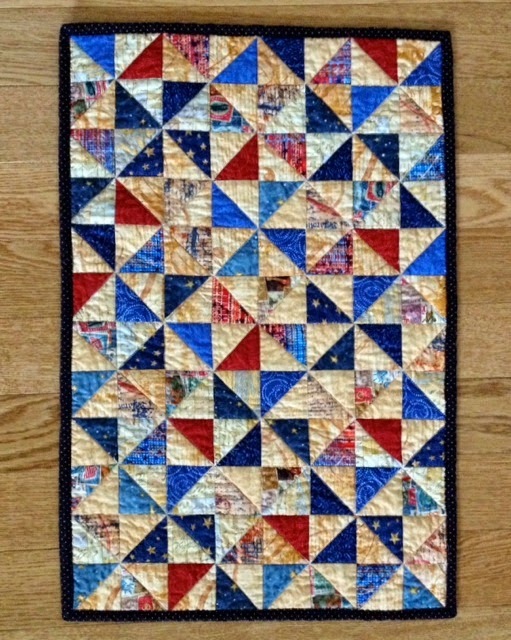 I used the "stitch in the ditch" method of quilting and added the binding. 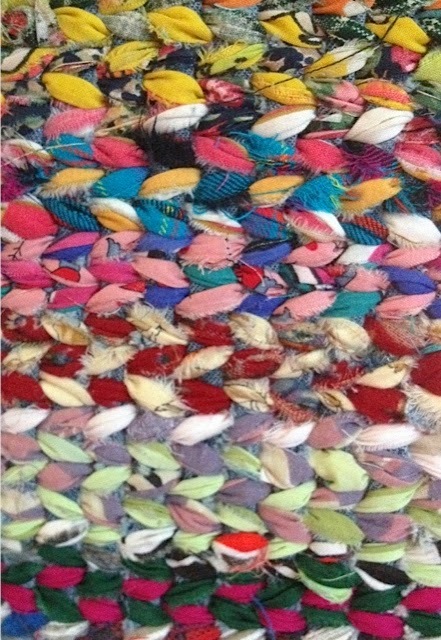 The mat has been laundered which created the "crinkled" effect.